"Reaching Triyuginarayan in the initial phase was one of the toughest journeys for us. The village doesn’t have visible loss to property or life, something needed by the agencies and government to be called affected!! And yet it is one of the worst affected. Local economy is collapsed and the people remained cut off without livelihood. If you have milk there is no customer to pay for the tea and if you have potato- no roads or transport to carry it to the market!! 3 months later, often people say ‘there were floods’ in Uttarakhand but on the ground we still find villages where no one has reached except some air drop of basic relief material. While the roads are opening up, now the attention has moved and the number of agencies and people working there has also come down in a big way". Says Goonj, an NGO who has continuously worked to on the ground in affected areas. Uttarakhand government records state that 1,940 dwellings were completely damaged, 1,575 severely damaged and 5,647 were partially damaged in the disaster. It's "mission rebuild Uttarakhand" as students from seven architecture schools, including the School of Planning and Architecture in the city, are coming together to create design solutions and implement them. The month-long workshop will take place in stages at different locations. The selected designs will be implemented in Chamoli, Rudraprayag, Uttarkashi and Tehri regions. Mohit Verma, founder of Architecture Research Conservation Habitat and Design Education (ARCHADE), said the plan is to bring awareness among students and engage architecture colleges in a common cause. The Indian National Trust for Art and Cultural Heritage (INTACH), whose survey team was at Gangotri-Harsil-Maneri-Uttarkashi axis between June 14 and 22, has some pertinent recommendations. "A resilient ecosystem can regain its equilibrium even after a major natural disturbance. But human interference is robbing ecosystems of their resilience, pushing them beyond recovery. Following the cloudburst in mid-June, Uttarakhand is on the brink of such an ecological disaster." says Manu Bhatnagar of INTACH. He goes on to add- the native oak forests, whose root systems bind the soil, are being replaced with commercially valuable pine plantations that yield timber, turpentine oil and pine needles. These tropical trees can be seen replacing alpine trees even at higher altitudes. 1.Reforestation with native species that not only thrive in the region but also aid soil and water conservation should be part of the state’s policy on conservation of forest and environment. 2.Tubewells should not be permitted beyond 1,000 metres above the sea level. This policy measure will help restrain urbanisation in the middle and upper reaches of the mountain. 3.It is necessary to evaluate the current status of dams to assess the loss of storage capacity, revise their life span figure and reassess the utility of the worst-hit projects. It should not shy away from decommissioning a few projects as warranted to prevent disasters. 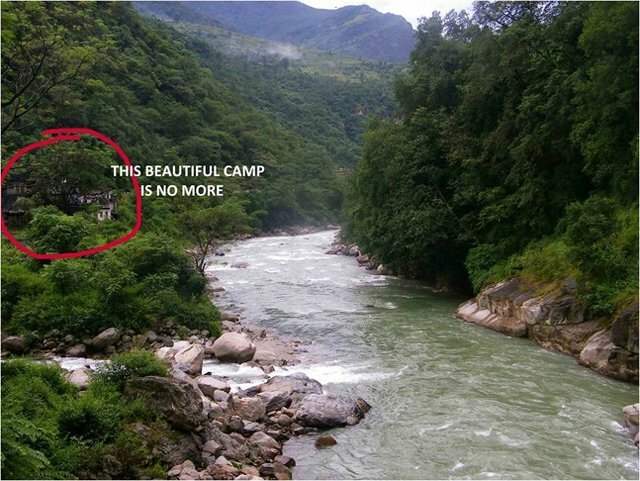 IndianWildlifeclub.com continues to follow up the progress made by Yashpal Negi whose camp, which housed bird watchers from all over the world for 13 years, vanished overnight. I spoke with Yashpal Singh Negi on 19th September. The weather has cleared and the rebuilding of the Camp has already started. He has already made the doors and windows for the new camp. The stone laying ceremony ill be on 15th October, when his mentor is expected to arrive. By the way his mentor is a bird watcher who motivated him to take the leap from being a bird guide.to a bird tour organizer. The Uttarakhand Government has announced that the Char Dham Yatra is soon starting in October 2013. Yatris will trek 24 km instead of the 14 km earlier. Mr. Negi feels tourists will start arriving by February 2014. Please remit your contributions directly, and intimate him accordingly. Those who contribute more than Rs 1000/- may send in their name, email id , date and amount of credit to susan_sharma@hotmail.com. IndianWildlifeClub .com will send a high resolution copy of ‘ Morning Glory at Kedarnath” to each one of them.